Quirk stood on the quay, stared out to sea and swore. Nothing. A few yards of choppy, green sea, and then the whole world faded away into grey fog. He could hear ropes creaking in the thick, damp air. Men grumbling quietly to themselves. The hulls of the boats bumping and jostling against the wooden spars of the jetty, as if impatient at being tethered for so long. He could taste salt and smell the familiar, sharp tang of fish. But he could see nothing. For three days now it had sat there. It crept a little inland, washing over the town like a slow flood. It stretched out to sea, all the way to the ends of the world so far as anyone knew. And there was nothing to be done about it. He cursed again. There wasn’t a breath of wind on his face whichever way he turned, no suggestion of a breeze to blow the great sea-har away and let them sail. He thought of the cargo of smoked fish in the hold of Sheerwater, the weight of all those herring in all those barrels sucking her down into the water as if a sea-serpent had hold of her. He dreaded to think what the cold and damp was doing to the fish. And the Western Isles four days sail away even when the fog did lift. He cursed again, but the wind still refused to stir. Quickly, for perhaps the twentieth time that day, he walked back along the quay, the wood beneath his boots shiny and slippery with water and the crushed remains of fish. He ignored the squat, rounded shapes of the inshore trawlers, their crews listlessly mending nets, caulking hulls, coiling lines. He strode angrily between small towers of barrels that overflowed with salt and the smooth, metallic shapes of fish. He kicked at the nets that had been thrown into rough piles, ready to be checked and folded. Only back at the sleek, lithe lines of Sheerwater did he stop. Standing next to her there as she chafed at her moorings, he could barely see up to the top of her mast. McBride stood at his customary station next to the tiller, watching over the boat, one eye always on the short gangboard that crossed to the quay. As ever when they were in dock he looked wary, mistrustful of the land they were tethered to. He rarely went ashore. What it was he feared there, this man who feared nothing, Quirk had never yet found out. Some event in his past, or some series of events, quietly haunted him. Something that had happened to him or to those close to him. Whatever it was, whenever he did make one of his rare, lone forays into port, his eyes were as wide and his breathing as laboured as any fish hauled up in a fisherman’s nets. Yet he was a tall, strong man—the strongest man on the boat. His hair was long, lashed into a single sheaf with beautifully-knotted leather thongs. His face was worn and a little raw, like ship’s timbers long-exposed to the elements. Here and there it was mottled and pocked, as if he had once been encrusted with barnacles. Quirk trusted him like no one else. Over the years that they had sailed together, his seamanship, his knowledge of wind and water, the sheer strength of his arms, had brought them safely around or through many storms. When he thought of him, Quirk saw him standing there at the tiller, seeming to hold in check the force of the whole sea, roaring orders to the rest of them. At times like that, even Quirk did what he was told. Quirk walked over to the tiller, glancing around the boat at the furled sails, at the crew being kept busy mending sheets and cleaning decks. “How are the men?” he asked. McBride generally acted as spokesman for the rest of the crew when it came to speaking to Quirk. At the same time, Quirk relied upon him to control the boat and relay his orders to the men. It was difficult being caught between Captain and crew like that. McBride looked over at the quay then, his wariness clear in his eyes. He nodded slightly in that direction. A roughly-dressed man, a beggar perhaps, had walked along the quay and stopped at Sheerwater. His clothes looked old, often-repaired, ragged. His hair was roughly cut. Quirk was put in mind of some great, old crow perched there on the quay, his feathers greying and unkempt but his eyes still sharp beads of black. Over his shoulder, the strap of a leather bag. A hawker, perhaps, hoping to sell them some useless trinket. McBride exclaimed quietly beside him. “If you can give me one good reason why you should do so,” said Quirk. “You seem to know much about me and my business.” Quirk still had not moved from his position at the tiller next to McBride. He stood there with his arms folded, much of his suppressed anger clear in his voice. Quirk knew the man was trying to placate him, trying to get round him with his easy praise. A part of him fell for it. Quirk snorted, laughing openly. At the same time he was disconcerted. This was no ordinary stranger. Everyone born and raised on the island was wary of magic, knew well that unhuman creatures walked the land. And Quirk, a sailor, was more superstitious than most. His life was spent at the mercy of the sea, and the gods and demons who lived there. At the same time, he had found it best over the years not to show any of this fear to his men, to appear the fearless sceptic. “Captain.” It was McBride beside him, speaking quietly so that no one else would hear. There was something a little like fear in his voice, this man that had shouted down tempests before now. His eyes were wide, concentrating on the stranger as if caught by some glamour. McBride said nothing else. He didn’t need to; he knew that Quirk had heard him. Few spoke so openly of the Wycka. Among sailors it was almost unknown to do so, except perhaps when they were far at sea and out of their power. That the stranger so casually invoked the name of the Queen of Spells shot icy water down Quirk’s spine. He was in a difficult situation now; clearly this was no ordinary man. He had heard plenty of tales of the prices people paid for using Wycka magic. He feared their ancient, night-time, woodland magic of blood and cobwebs. At the same time, he was conscious of his entire crew looking on, listening to every word, conscious of his position with them. A few sailors had drifted over as the conversation had continued. There was an audible gasp from them now. Only someone powerful or foolish would be openly critical of the Druidh in such a public place. Quirk feared them as much as he feared the Wycka. Perhaps more—their hard, bright, green magic seemed somehow less human. And the control they held over the lives of the islanders seemed to grow greater with each season. He was in a tricky corner and the stranger stood there still, smiling gently as if they were discussing the weather. He could see only one way out. And, who knew, it might even allow them to get their cargo to the Western Isles after all. Quirk reached up to one of the ship’s booms and picked off a brass and glass lantern, its base full of fish oil ready for the night watch. It would be as dark as peat out of town. He walked back across the gangboard to the quay and the waiting stranger. He was taller when you were close to him, and his face looked old and worn. But his clothes and boots had once been well-made. The stranger reached then into his leather bag and pulled out a sheet of creamy parchment and a quill pen. Swiftly, resting the thick paper on his spare hand, he made some marks, then handed it across to Quirk. Quirk nodded. He had met perhaps one other person in his entire life who could write. He took the paper and looked at the marks on it. They meant nothing to him although he liked their clever intricacy, like so many knots in a fine rope. He folded the paper carefully and put it in a pocket. The stranger made a sudden, complicated movement with his left hand then and touched the lamp that Quirk carried. It sparked instantly into flame and began to burn with the greenish-yellow flame of fish oil. He smiled. Quirk, unable to think of anything to say, nodded once again and strode off towards the town. Outside Douglas, the island was dark save for the occasional croft or cottage. The land sloped upwards away from the coast, and he soon climbed up far enough to escape the fog. By then it was fully night. There was no moon and the stars seemed especially cold and distant. His oil-lamp was a flickering, insubstantial smudge of light, crushed by the weight of the darkness. There could have been anyone or anything walking behind him, or beside him, and he would never have known. He knew the tracks and paths of the island as well as anyone; he had spent much of his youth wandering over them. But even so there were frequent alarms when it seemed that he was lost. The night played tricks on him. Time and again he thought he was long past turnings in the path before they finally slipped out of the gloom. He had been to Slieu-Whallian twice before. Once as a boy, brave enough to get within sight of Caillagh-Ny-Ghueshag’s house, not brave enough to approach it. The second time, as a young man—brash and foolish, no doubt. He had come to a rolling. He had been full of excitement at that, he remembered, probably the worse for drink. But when it came to it he couldn’t watch. He had stood apart from the shouting crowd, and left quietly before the end. On both occasions it had been a bright, clear summer’s day. Now it was the middle of a very dark night, and a different matter indeed. He could easily turn around and return to the harbour. Everyone would understand. No one need even know. Across the valley, he could see the light from the Queen of Spells’ house. She may or may not be awake—as a Firegiver, she would always keep a flame burning for people to take from when they needed it. The long, steep, slope of Slieu-Whallian was invisible of course, but he knew that her house, an ancient crofter’s cottage, was right at its foot, within sight of the small lake in the valley. He shivered. It was a terrible place. And that she chose to live there, of all places on the island, was the most chilling thing of all. But he had come this far, he wouldn’t turn back now. He thought of his men back on Sheerwater, wished that McBride at least was there with him. He thought about the stranger, and wondered once again what the writing on the note said. And if this really was Mannanan Mac Lir, what was he doing stepping out of their fireside stories and onto the decks of his own boat? It was the thatch-weights that finally rattled him. He skirted carefully around the lake and up to the cottage and was about to knock boldly when he saw them. Most people lashed large stones to the ends of the ropes that they slung over their roofs to keep them in place. Caillagh-Ny-Ghueshag used skulls—sheep, cows, horses, other animals he couldn’t recognize. Skulls filled with small stones and packed soil, the ropes tied through eye-sockets, around horns. In the daylight he would have barely noticed them. Now, standing there in the depths of the night, after that long walk, his nerve finally failed at the sight of them. The impulse to run was strong. He stood there unable to move. The cottage door opened. Against the wavering, red light from inside he could see only a silhouette, a single figure about his own height. For a moment there was silence as the Queen of Spells considered him and he, in turn, stood as still as any standing-stone. He had expected an old crone, a cracked and hard voice. But she sounded only a little older than himself, and there was a hint of amusement in her voice. It was enough to allow him to speak. She stepped back, granting him access. He followed her in, immediately grateful for the warmth of her cottage. He wasn’t sure what he had expected to find, but he was surprised at how ordinary it was. A small, stone room lit by fire and candle, rough rugs on the floor, wooden furniture, everything meticulously swept and cleaned. Familiar smells of peat-fire. Only three shelves of books, strange liquids brewing and bubbling in pots and the occasional alarming totem—a longtail skull, a dead crow, an eye daubed in red on a wall—marked the place out as belonging to the Queen of Spells. Near the fire, the perpetually burning fire, lay a huge black dog, a great shaggy wolfhound. It watched him keenly as he moved, panting faintly as if it had just returned from a chase. The dog didn’t move from its place as Quirk sat down, nor did it take its eyes off him once. He tried to ignore it. She took the piece of parchment from his hand and angled it towards the fire to read it. Quirk sipped from his drink. It tasted good, warming him from the inside. “So, you will help us? She seemed to study him for a long moment, as if assessing him or, so it seemed, remembering things about him. He sipped the last of his drink and said nothing. She stood and up and walked into the shadows at the back of the room, disappearing completely from view. It was said that there were tunnels and caverns underneath Slieu-Whallian, a whole Faerish palace perhaps. He wondered if there was some entrance way to them back there. The huge dog’s eyes were still intent, unblinking on him. He had the distinct impression that he only had to make a single move and the hound would leap up and kill him. He tried to ignore the thought. A single, pained scream rang out from the shadows then, alarming and urgent. He started to move, then thought better of it as the dog growled faintly, almost gently. Another scream came, and another. If he was back on board he would have run instantly to see what was happening. Here, he was out of his depth, had no idea what he should do. Another scream came, and then silence. She reappeared back into the light then, looking a little drained, panting a little like the great dog. In her hand she carried a short length of rope, with four intricate knots strung out along it. She offered the rope to him. He didn’t recognize any of the knots; couldn’t immediately see how they were tied or how to be untied. He nodded at that and turned back to look at the dark. Away in the east, the first, faint lightening of the sky could just be seen, a faint glow over the hills. He set off into the night, his fish-oil lantern burning brightly long after it should have flickered out. Three hours later he arrived back at Sheerwater—tired, sore, but greatly relieved. McBride was at his usual post, watching warily. The other crew members were below. Only the stranger was on deck; he lay asleep there on the hard wood, his head resting on his leather bag. As Quirk walked back across the gangboard, he stirred and sat up. “I do,” said Quirk, holding out the length of rope, a little uneasily as if it was likely to come alive and bite him. Quirk nodded, tied it around his neck with a fifth, loose knot of his own, a rough sailor’s necklace next to the small lodestone that he wore on a chain. The tide was already ebbing. They untied and pushed off from the quay with long, wooden poles. The flow of the river that emptied into the sea at the port, along with the pull of receding tide, carried them slowly away and out towards open water. The fog was as thick as ever and they lost sight of the quay within moments. Soon they were caught in their own little world, a pocket of sea with mist walls. It seemed that they weren’t moving at all although Quirk knew that they must be. It was disconcerting not knowing exactly where they were, what was up ahead. He felt alarm rising; there could be rocks, currents, other boats, all sorts of dangers around them. The stranger looked calm. He stood right in the bows, looking keenly out to sea, breathing in the spray and air as if he knew their position by smell or taste alone. After long moments, he turned and called to Quirk. “We are clear of the bay. A south-wester now will take us up along the coast of the island.” The stranger pointed off to the port side as he spoke, indicating the direction they needed to travel. “Very well. “ Quirk untied the rope from his neck and began to unpick one of the Queen of Spells’ knots. It was intricate and unusual and for a time he couldn’t see how to do it. Then, by pulling sharply on a particular loop, he found that it fell apart quite easily. There was calm for a moment. He was conscious of the crew looking at him expectantly. The air didn’t stir. He turned to face the south-west as if he would be able to see the wind coming. There was the slightest movement of cold air on his face, like some small sea-creature breathing on him. The wind picked up rapidly, grew stronger. Quirk shouted for sails to be hoisted. They billowed out instantly, hauling the ship rapidly around and thrusting it forwards. The wind was strong now, strangely constant too, with no gusts or lulls to it. “Very well”. Quirk turned and went aft to the great wooden tiller, where McBride already stood, holding the ship’s course with strong, gentle hands. Mac Lir walked to the prow and gazed out to sea as if following a trail he could see on the water, although the fog was as thick and impenetrable as ever. They sailed like that for the whole morning, Quirk and McBride taking turns at the tiller and going below for a few hours sleep. Mac Lir stood there the whole time like a figurehead. They had to peer around the masts to see him. Occasionally he would lift one of his arms a little, which they took to indicate a slight course adjustment. The higher the arm, the harder they needed to turn. Some time in the early afternoon, Quirk was back at the tiller, his eyes alternating between the figure of Mac Lir and Sheerwater’s sails. The fog was as thick as ever—thicker, perhaps. It seemed to Quirk now that they weren't moving at all, even though the wind was constant and strong, holding the sails in taut, rippling curves. Still, they seemed to be nailed there to the water. If Mac Lir had their course right, it would be a swift journey after all. He was thinking about the money they could make on their cargo at the Western Isles, how to pitch the trading, when Mac Lir rapidly held up both arms. The meaning seemed clear. Quirk called to the men to haul in all the canvas; stop the boat. He lashed the tiller straight and hurried forwards to where Mac Lir stood peering overboard. There was something down there. The water all around them was strewn with debris. A raft of wooden splinters and timbers bobbing and blinking in the swell. Quirk picked up one of the long catch-nets that were stowed in the bows and fished some of them out. They were ship’s timbers, no doubt about it. He picked out a large piece. Clinker built, poorly maintained and in need of tar. They hadn’t been in the water long though, the torn edges were still sharp and clean. He hadn’t heard McBride come up behind them. The tall man was standing next to him, examining another of the fragments of wood. "See." Quirk took the piece of wood. Its edges were charred black. It was, he knew, surprisingly hard to set fire to a wooden ship at sea, even when the air wasn't so sodden with fog. He handed the piece on to Mac Lir. The stranger turned the blackened shard of ship's timber over and over in his hands, as if searching for some answers there. He said nothing for a while. "We'd sailed alongside and against each other for years. But he was no friend. A cruel and stupid man, I'm surprised he lasted as long as he did. I wouldn't go to sea on any boat he was the master of. Whether he burned alive or drowned first, I can’t say that he didn’t get what he deserved. That’s harsh maybe, but only the truth." "What's going on here, Mac Lir? You expected something like this I’m thinking. You must tell me what it is you're asking my crew to face. We're sailors, and good ones, but we're not warriors and we're not heroes." Mac Lir smiled, regret clear on his face. "I know nothing, Captain Quirk. I have heard some rumours of something out here, it is true, but I do not know what. That is why I took passage with you; to see what I could find." "Vague ... rumours of danger." "You must understand that some of what I hear is very unclear. Gulls and Storm Petrels come off the sea screeching about threats and dangers. Maybe they really have seen something, or maybe they have just caught sight of a Sea Eagle or a shadow upon the face of the sea. Or I catch a faint scent of something on the wind, or the Wycka tell me of some portents and signs that have come to them. I hear all these things and when it seems that there is some substance to them, I come to see. I can't give you anything specific, Captain Quirk." He sighed. "Very well. Maybe Crellin was fool enough to set fire to Phynodderree before he sailed her onto some rocks. Or maybe something did the damage for him. I suppose we might as well sail on as back, but it must be clear between us that you tell me everything you know, or even suspect." Quirk called to his men to start putting the canvas back up. Smoothly, they pushed on, nosing their way through the shattered remains of Phynodderree. They sailed on as before, Mac Lir at his post in the bows, Quirk and McBride taking turns at the tiller. The wind showed no signs of fading or turning. Sheerwater skipped sweetly along, her stays and sheets creaking with pleasure at the speed they made. 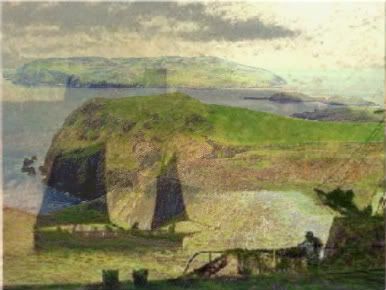 They must have been somewhere near the northern tip of the island, Quirk reckoned, somewhere near the place where they would need to turn north-westerly, when Mac Lir held up both his arms once again. He called for the sails to be pulled in. Mac Lir immediately turned back to the boat at that and put one hand firmly over his mouth. Silence. There was danger near at hand. “Boats out there.” Mac Lir looked distracted, as if concentrating hard on trying to hear a faint sound. “How many? Who are they?” They spoke in hushed voices, almost whispering. He was aware of the crew watching them from all over the deck and the rigging, bearded faces peeping out of the mist, waiting to see what would happen, what he would do. He hesitated. He took a short knife from his belt and cut off the end of the knotted rope that he still held in his hand, casting the small piece overboard. The wind calmed immediately. Everything became quiet, nothing moving. Even Sheerwater stopped creaking and breathing for a moment. Mac Lir looked back, surprised for the first time. Quirk smiled slightly. "I mean, I don't swim." "Indeed?” Mac Lir looked fascinated, a little amused. “Yet you make your living on the sea, sailing these dangerous waters. You must be able to swim." "Mac Lir, this boat is my home. The sea is my home. But I've seen what the ocean can do and I fear it. I love it, but I know that it does not love me. I know also that if this ship goes down then I will drown. So I've never learned to swim. I’ve learned not to swim." "If you take chances with the sea, sooner or later it will claim you. Maybe it will anyway. But knowing I’ll drown easily makes me more cautious, more careful. If I did learn then no doubt I'd be more willing to take risks. Captain Crellin, they say, swam well." "Some might say running this voyage is taking a risk. Or taking me as a passenger." "Maybe so, but I trust to my instinct too." "And your men know this?" "They do. I tell them the first day they come on board, before we ever leave dock. Tell them why too. They always look happier when I do." They tied long, thin ropes to each of the small, circular, animal-hide coracles and lowered them into the water. Quirk and Mac Lir clambered down the side to kneel in them, bobbing and lurching in the choppy water. They paddled slowly off into the fog, dipping their oars in the water gently and quietly, first on one side, and then the other. They soon lost sight of Sheerwater. The lines connecting them to her playing out behind them, held by a crew member back on board but seeming to end in mid-air just behind them. Quirk’s mind conjured up dragons and demons all around them in the heavy fog. He could see indistinct shapes moving around off to his left and right, although there was nothing there if he tried to look directly at them. He tried to ignore them, telling himself it was just the swirling sea mist. After a few minutes Mac Lir stopped paddling and pointed up ahead. There was a definite shape there now, not shifting around, but dark and stationary in the water. A boat. He could see little detail, could gain no idea of the size and form of the vessel. He began to see others as his eyes grew accustomed to the gloom. They were all around, perhaps nine or ten of them. Mac Lir nodded to him and moved on, placing each oar-stroke into the rough sea-water with precision and care. They moved forward, careful to keep the line back to Sheerwater clear. He could see figures in one of the boats now. At first it seemed that there were a number of adults and a child standing there. He could hear indistinct voices, several at once. Deep voices. Mac Lir was watched them intently, his lips moving slightly as if counting. There was something familiar about the smaller figure on the boat but he couldn’t decide what. They seemed to be wearing a cloak, and some sort of adornment on their head that he recognized. A sort of uneven, spiked hat or crown. But he knew, then, that this was no child. An adult, a man. Which meant that the others must be enormous, giants of some sort. Nearly twice his height, much bigger than McBride. He wondered if the smaller figure was a prisoner, or their leader. If only he could put his finger on who that person was. He knelt there rocking to-and-fro in the flimsy coracle, the waves almost coming over its sides, he legs becoming numb with cold and tried to remember. Mac Lir turned to him and nodded back in the direction of Sheerwater. Quirk turned and pulled smoothly but firmly twice on his line. Almost immediately, the crew back on the boat began to reel both of them in. Quirk watched the giants and the ships fade back into the grey gloom. Half way back, it came to him who the small figure must be. “They are Tho-Mooraine,” said Mac Lir. He, Quirk and McBride stood at Sheerwater’s tiller, talking in quiet tones about what they had seen out there on the water. “Never heard of them. Who are they? What are they?” asked Quirk. “And I think I agree with you.” Mac Lir spoke in hushed, almost bitter tones, but it was McBride’s face that caught Quirk’s attention. Anyone that didn’t know him would have seen little change. Quirk recognized the slight scowl, the narrowing of his eyes. It was what he did when a black storm that filled half the sky ran hard at them. In him it was like other men shouting. “They would make us all slaves.” It was McBride that spoke, almost whispered. They lowered the barrels gently into the water, the crew working together as calmly and efficiently as if they were unloading at the dockside. There were only occasional mutterings of disbelief at what they were doing. Quirk felt strangely cheated too, even though they had been paid as good a price as they could have hoped for. He was more worried about the Tho-Mooraine though. He repeatedly scanned the thick fog, expecting all the time to see the great hulks of their ships looming suddenly near. He went to speak to Mac Lir, who was watching his expensive cargo of fish being returned to the sea from whence they came. He could think of no other reply to give, no other course of action that offered much hope. He had to think of the island as well as himself, his crew. Mac Lir turned and walked to the rail, looked out over the sea. He raised his arms and shouted something, the sound alarmingly loud. The words were indistinct, or in some unknown language. He began to move his hands, his fingers in subtle, complex patterns, as if striving to shape the air into new forms. The mist began to part, a clear circle of air opening up around them, receding rapidly away outwards over the water. From up above, sunlight shone suddenly through, glorious and hot from a bright blue sky. The walls of fog fell back and back, away from them as Mac Lir continued to form his magic. Or unform it. The boats of the Tho-Mooraine sprang into existence, appearing crisply out of the fog, suddenly very real and nearby, stamped there on the water, conjured from a hazy half-existence into stark reality. Shouts and roars came to them across the gap. Off the other bow, the line of the coast was sharp and clear. The Creggyn Doo would be nearby, perhaps only minutes away in the rapid currents that swirled around the northern tip of the island. There was no breeze, no point in raising canvas. Quirk thought about untying another knot. He thought about the delicate manoeuvres they would need to make when they reached the shoals and thought better of it. He could feel Sheerwater being born along, towards the rocks and the coast. There was nothing to do but stand there on the open ocean, and watch and wait as they were pulled in, as the great boats of the Tho-Mooraine were pulled in slowly after them. They were close, very close, the smooth surface of the water already beginning to swirl and roughen as they approached the sharp, underwater rocks. Great, roaring figures lunged out of the water, up the sides and onto the decks. Giants with fierce, crazy eyes and terrible laughter and great blades drawn from sheaths on their backs. The Tho-Mooraine. They must have swum under-water, caught them up when they thought they were safe. Some of the crew fought back, others climbing the rigging to try and escape in their panic. The Tho-Mooraine attacked them all, knocking the islanders flying with roars of laughter. Quirk saw McBride try to take one of them on, saw him looking suddenly tiny and weak, saw him knocked sprawling onto the deck with a single, easy sword-blow. He couldn’t see Mac Lir. He ran forward, ready to take on the invaders as best he could, taking with him a short sword blade he had stowed at the tiller. A heavy, jarring thud that rattled the teeth in his mouth, a sickening, hot pain in his head, and everything went dark. Before he opened his eyes, before he was even truly conscious again, he knew he was no longer on Sheerwater. It didn’t smell right and it didn’t move right. The pain in his head came next, and then a dim, grey light as he squinted open his eyes. The whole crew was there. No sign of Mac Lir. There was blood all over them, cruel cuts and bruises. Ropes bound their hands and feet. Most of them were unconscious, lying at awkward, uncomfortable angles as if they had all just been thrown there like sacks. But they all seemed to be breathing. From outside, above, he could hear the creaks of the Tho-Mooraine ship, the occasional word spoken in a language he didn’t understand, someone somewhere humming a tune. “I felt them rowing before. They must have hauled us around the Creggyn Doo. They are too strong, these giants.” It was McBride, speaking off to his left. He heaved round a bit to see him. A bad cut on his left temple had left dried blood over half his face. In his dreams he had seen McBride’s body, slain by the invaders. He had imagined him lying there on the deck of Sheerwater as she drifted unmanned onto the black rocks. Over and over again he had seen it. In the distance, thin lines of smoke had risen from the island’s coast. Quirk smiled, although it made his head throb more. Several of the crew appeared to be conscious now, their eyes opening at McBride’s words. “Hmm.” The light in the hold came from an iron grill in the roof, a hatchway big enough for the Tho-Mooraine to climb in and out of. One of them was up there now - massive, booted feet paced backwards and forwards upon the deck. The guard paused in his pacing for a moment, then continued as before. There were calls from up top, but they only sounded like the normal cries of captain to crewmen. The faint humming—a sea-shanty, he thought—was still audible from elsewhere on the ship. Braided into the knotted sheaf of his hair was a long, thin, sharp blade with a small, metal handle. McBride always went about with it, as much out of superstition as anything else. “Well, well, better and better,” said Quirk. Something was slotting into place in his mind, as satisfying as the pieces of a well-carved wooden joint fitting together. He dropped his chin onto his chest for a moment. They were all still there. The pieces were in place. They were all awake now. They listened, some mouthing words, some straining to hear. It was an old sea-tune, that was for sure. “That’s Mac Lir singing?” asked McBride. They nodded, saying nothing. Quirk untied the lodestone from his neck and let it swing free, finding north. After a while it settled. Quirk took Caillagh-Ny-Ghueshag’s rope then. He remembered her warnings. Shrugging, he turned to face the right direction and untied all three remaining knots. As before, there was a moment of calm. Then, with a single shout of warning from up above, a solid wall of storm slammed roaring into them. It lifted the ship and threw it across the waters, heeling it over at an alarming angle. It seemed that they might go under for long moments as the boat twisted and lurched around like a twig in a whirlpool. From up top, there were cries and shouts. It sounded as though some of the giants were injured—crushed by collapsing masts maybe. All around them, audible even above the terrible howl of the wind, the Tho-Mooraine vessel creaked and groaned and splintered. “Go now, go, go! Get across!” He had to shout to hear himself heard. They pushed the iron grill up and out, then took turns to climb out, pulling and pushing each other through the gap. Still the ship veered around out of control. Water flooded into the hold as great waves crashed over the entire ship. Quirk and McBride left last. Up on deck it was chaos. The giants, for all their strength, were struggling to pull in the canvas. The force of the wind had locked ropes fast against masts. Half of the rigging was in tatters anyway, stays flapping dangerously around. They watched as a wave sucked three of the Tho-Mooraine into the boiling, bottle-green, slate-grey sea. The crew were managing to veer and stumble their way across onto Sheerwater, going around the edge of the deck and pulling themselves along the bulwarks. There was no sign of the other hatches—too much water flooded the decks. Quirk had a sudden image of a bound Mac Lir drowning in his hold as water gushed in. They stumbled forwards, holding onto each other, half crawling against the fury of the wind and waves, struggling just to find lungfuls of air. By touch alone, they found the grill. They heaved it aside. The hold wasn’t full yet, but it would be soon, the boat slowly succumbing to the volume of water flooding it. Quirk took McBride’s blade and pushed himself through head-first, half-diving, half-falling. Mac Lir was there, his feet and hands tied, his mouth gagged. The water was already up to his chest. Quirk began to cut the ropes, starting with the feet whilst he could still get at them. Then the hands, then the gag. McBride reached down through the hatchway to help heave them back up. It was hard going. For a moment Quirk thought that they wouldn’t be able to do it; the weight of water was too great. Then, in a lull between waves, they managed to haul themselves up onto the flooded decks. Nearly swimming now, they made their way aft, to where Sheerwater had been tied. She was no longer there. The crew had got onto her, cast themselves off from the Tho-Mooraine ship as instructed. They stood some way off, canvas all in but bucking out of control in the storm. She wouldn’t take much more of this battering. Quirk nodded, glanced to Mac Lir, then up to the bows. There seemed to be only a few of the giants left now on their ship. A few still struggled with broken masts and stays. Perhaps the others had all been swept overboard. Ahead of them, the Tho-Mooraine fleet was in tatters. Some had already struck the rocks of the Creggyn Doo and were crashing over and down into the water. Others, battered by the wind and waves, weren’t even getting that far. They dived down into the angry sea before they even got to the Teeth. Hampered by Sheerwater, their ship had been the slowest, and was now the last in line. Between mountainous, alarming waves, through banks of water that might have been spray or mist or rain, Quirk thought he could see five of the ships still afloat ahead of theirs. It was hard to be sure. The seas were terrifying. He waited for a few moments, then a few moments more. He was cold now, suddenly terribly cold, soaked through with the cold waters of the ocean. Still he waited. Ahead of them, another of the great ships splintered and crashed onto the rocks. Then Quirk took the short length of rope from round his neck once again, cut one piece of it off and hurled the fragment overboards. The howling of the wind lessened immediately. Around them, the seas raged slightly less as the witch-wind abated by a third. He had to time this right; had to make sure they had a chance to get across to Sheerwater without any of the invading boats surviving. “It’s still too much Captain! We can’t get across in this!” Another boat went down then. It stood poised for a moment as if on the crest of a great wave, then crashed down towards the sea-bed. He had an image then of her crew, of the Tho-Mooraine giants as they battled and screamed their last. They were great sailors Mac Lir had said. Terrible enemies but great craftsmen, great navigators. “The Tho-Mooraine are broken; they are no more threat to us,“ shouted Mac Lir then. “Come Quirk, drop this storm and let us escape. The island is safe.” There were only two of the giant ships left now; theirs and another. Quirk nodded. Very well. He tossed the last remaining piece of rope overboard. The wind dropped to a whisper. Between them and Sheerwater, the waters calmed, continuing to roll and swell a little as they settled down. They could make it in the coracles now. Up ahead, the other Tho-Mooraine ship, fatally damaged by the tempest, veered suddenly round and lurched down into the water. They had to leave now; the boat they were on wouldn’t last much longer. A hand was on his shoulder then, someone standing next to him, holding him fast. He turned quickly, imagining that one of the Tho-Mooraine had crept up to hurl them overboard. He found himself looking directly into the eyes of the Archdruidh. “You have room for another on your boat?” The voice was quiet, the eyes calm. The words were an instruction for all that they sounded like a question. The mouth smiled. For a moment he was disorientated. He had to think quickly. He had forgotten about the Archdruidh. But he surely wouldn’t know that they had seen him in the fog? He might accept that they believed him to be a prisoner too. Wouldn’t he? He needed them now to get him ashore. But was it safe? If they got back to land, could they trust him? The Druidh wouldn’t want anyone to know about their alliance with the Tho-Mooraine. They had to be careful here. Quirk prepared to reply. The Archdruidh had his eyes firmly locked on Mac Lir now. But, unexpectedly, it was McBride that spoke. Quirk was too surprised to say anything. Then, although he had no idea what McBride was doing, too much his friend to argue. He had never known him to show such respect for the Druidh before, nor to give him an order. But, whatever he was thinking, he would let him do it. He nodded at Mac Lir, who also said nothing, even smiled a little. The passage across was uneventful. They let themselves down a swaying rope to the water, and stepped precariously into the tethered coracle. Carefully, slowly, they paddled across. With two of them they were dangerously low in the water, and the occasional big wave still threatened to capsize them. But with care the short journey could be made safely. Quirk was never so pleased to be back on board his own boat. Welcoming, familiar arms hauled them up onto the decks. Sheerwater was filled with cries of relieved laughter. McBride and the Archdruidh came next. Quirk stood and watched them, wondering what was going on, how they should play this, how it would all turn out. He thought of something that McBride had said before, something about the Druidh wanting to make the islanders slaves. And now this strange behaviour with the Archdruidh. As before, a few pieces of understanding slotted quietly together in his mind. He thought then that he maybe knew where it was that McBride went when he set off ashore by himself. Things mentioned over the years, looks in his eye, some guesses began to add up. The crew liked to joke that he was off drinking and womanising. But no, that wasn’t it. They were half-way across now. He could see McBride’s face, the Archdruidh’s back. The crown of mistletoe and gorse rising and falling in the heavy swell. McBride was talking. He had stopped rowing now. “You don’t recognise me, do you?” McBride asked. The Archdruidh looked at him as if seeing him for the first time. Until then he had paid him no real attention, his mind clearly elsewhere. He was just some sailor, convenient but unimportant. “I meet so many people,” the Archdruidh said, smiling ruefully at the burdens of his office. The Archdruidh did not bother to reply, as if being watched was only what he expected. There was silence for a moment as they bobbed together in the coracle. McBride, still holding the oars up out of the water, surveyed the sea as if waiting for something. The Archdruidh opened his mouth, about to reply, amusement clear on his face. As Quirk looked on, another big wave rolled in, slipping around Sheerwater and on to the coracle. McBride would see it coming, would position them to ride over it. Quirk knew he would. But he didn’t. Instead he was speaking again. Quirk was about to shout a desperate warning when the wave hit, flipping the coracle up into the air for a moment, nearly turning it right over. McBride must have braced himself, knowing what was coming. The Archdruidh was caught unawares. He half-jumped, half-fell out of the skipping coracle, landing back in the water a good yard away from where McBride sat. There was a cry then, and a flurry of splashing as the Archdruidh struggled to find the air. But either he couldn’t swim, or his clothes were too heavy, or something else pulled him down. A few, brief moments of splashing and his efforts ended. McBride looked on all the while, impassively, holding his position with expert ease. The Archdruidh slipped down into the waters. All that was left was a quiet sea and McBride alone in his coracle and the crown of mistletoe and gorse floating there on the waves. McBride waited for a few moments, paddling around in little circles. Then he continued on his way back. Quirk helped to haul him aboard. There was a moment when they looked at each other with complete openness, so that Quirk knew that McBride had deliberately drowned the Archdruidh of Mann and McBride saw that he knew. For that moment it seemed as if a tie as strong as any ship’s rope held them fast together, and that the world went quiet around them. McBride smiled a little at that, looked slightly unsure also. No one else was near. No one else could hear their words. They stood there for a time, saying nothing. Mac Lir was up in the bows, watching the wind and the waves, occasionally glancing back at them. Quirk smiled too. Above the bows, over the sea, the lights of the houses were beginning to come on from the shore. “A Sorcerous Mist” previously appeared in Deep Magic 37. Simon Kewinwrites fiction, poetry and computer software, although usually not at the same time. His fiction and poetry has appeared in a wide variety of magazines and anthologies. He lives in the UK with Alison and their two daughters Eleanor and Rose. His web site is http://simonkewin.co.uk and his blog is http://spellmaking.blogspot.com. I don't think there's any great mystery about that. I think we all make sense of the world through stories. We gossip our experiences to each other in the form of little tales. The media calls events in the news "stories". I think our brains have evolved to form narratives and all a writer does is set them down. And, I suppose, jumble up ideas and associations from a variety of different places to form something new. But I don't think there's anything particularly special about doing so. In the case of "A Sorcerous Mist," a lot of the ideas came from the myths and folklore of the Isle of Man, which you may or may not have heard of. It's a small, Celtic island in the middle of the Irish Sea, roughly equidistant from England, Ireland, Scotland and Wales. It also happens to be where I was born and raised, although I'm mostly English these days. But the old stories from the island have long fascinated me and they were my starting point. Mannanan, for example, is a "real" myth, and he did (does?) have the power to wreathe the island in mists to hide it from invaders. My forebears really did push suspected witches down Slieu-Whallian to see if they survived. And so forth. From these bare bones, the story emerged, piece by piece, slowly acquiring associations and connections along the way. Other writers may say a muse is involved in this process, or some mystical process of revelation. I just think my mind, like anyone's, wanted to think in narrative terms and so invented this.